The Historic Centre of the Town of Goías covers an isolated town in Central Brazil that has preserved much of its colonial heritage. The settlement of Goías is closely linked to the discovery of gold. Goías was founded by the famed Bandeirante explorer Bartolomeu Bueno da Silva, nicknamed Anhangüera, and was called in colonial times Vila Boa ("good village" in Portuguese). It dates from 1727, its name being a tribute to the Goyaz Indians, the inhabitants of the area before the arrival of the Europeans. Its houses, chapels and churches are testimony to the height of the gold rush era. 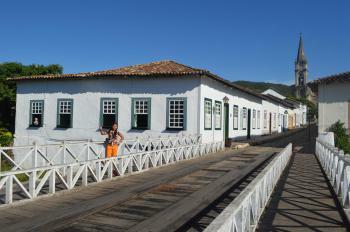 Cidade de Goias is yet another world heritage town in Brazil that became rich with gold. Up to the middle of the 20th century it was the capital city of Goias which was at that time the second biggest Brazilian state (after Amazonas), that was of course before Tocantins and Brasilia split away. It’s also known as Goias Velho, and lies magically in the Serra Dourrado hills. We chose to spend the night close to the river and the historical bridge, and were not dissappointed with the view from the balcony to the old city. The best thing to do is a stroll on these cobbled streets lined with beautiful townhouses, maybe in direction to the Museu das Bandeiras where a local guide will explain you the rich history of this building. Goiás (formerly called Goiás Velho or Old Goiás) was founded during the Gold Rush that took place in 18th century in Brazil. Goiás thrived as long as the gold mines were active, but stagnated afterwads, which helped to preserve almost intact its historical centre. 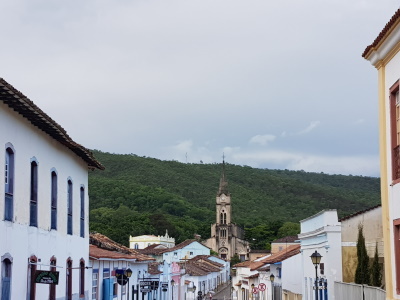 It cannot be compared with other superb colonial cities in Brazil like Ouro Preto or Olinda, but still, it is a nice place to be for a day or two, visiting its museums (the religious museum is particularly interesting) and enjoying its peaceful atmosphere. Goiás is about 200 km from Brasília (another WHS). Built in the 18th century: In 1748, Goi?s was chosen as the headquarters of a new sub-district. Amongst the first constructions was the Casa de Fundi? ?o (1750) for the control of gold, the governor?s palace (1751), and the military barracks (1751).